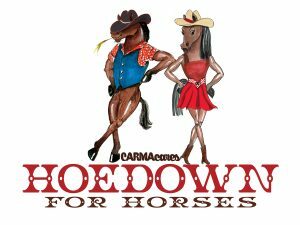 Embracing the Wild West roots of the Golden state, California Retirement Management Account (CARMA), a nonprofit dedicated to Thoroughbred aftercare, will host its 11th annual CARMAcares fundraiser on Sunday, July 22 at Del Mar Racetrack. Funds raised from ‘Hoedown for Horses’ will directly benefit the organization’s one-of-kind placement program and its grant process. At the hoedown, attendees will enjoy country-western themed evening with endless entertainment highlighted by a head-to-head jockey bull riding competition, line and square dancing, live music by American Country singer, Jake Parr and a photo booth. The competition will feature Southern California jockeys, Joe Talamo, Martin Garcia, Tiago Pereira, Reuben Fuentes, Flavien Prat, Geovanni Franco, Franklin Ceballos, Kyle Frey, Corey Nakatani and Asa Espinoza facing off in bracket-style system to crown a champion. In addition to all the excitement, a delicious barbecue-styled buffet, by Premier Catering, will offer three different types of gourmet sliders including pork, sirloin burgers and buffalo fried chicken served with kettle chips. There will also be a mash potato station with all the fixings for a feast. When it’s time for CARMA supporters to whet their whistle, there will be a no-host full bar. Festivities began after last race in Del Mar Racetrack’s iconic paddock at approximately 6:30p.m. Guests are encouraged to wear western-themed apparel, cowboy hats and boots. Hats will be available for a donation at the event. Individual tickets are $125 and sets of 10 can be bundled for $1,000. Sponsorships and underwriting opportunities ranging from $2,500 to $10,000 are still available. To purchase tickets or become a sponsor, visit https://www.carma4horses.org/events/carma-cares-fundraiser. For questions please call (626)574-6622 or email lmandella@CARMA4horses.org. Del Mar Racetrack is located at 2260 Jimmy Durante Blvd., Del Mar, CA 92014.